Might this be a time to compare Catholic social teaching begun 125 years ago with The Conditions of Labor by Pope Leo XIII? A central theme then and throughout subsequent teachings is the person, the laborer. Workers are to be given dignity, freedom from exploitation, and we are to be in solidarity with them in alleviating their ever increased suffering of poverty and hunger. Let us take time, then, to reflect on laborers and some of their realities that need our attention and faithful actions. Women and children are being exploited in labor trafficking, being forced in modern-day slavery to work for the gain of their often brutal captors. Many of these women and young girls are brought from other nations to serve in North American hotels, shops, sports events and other venues that serve us. Labor trafficking happens to North American women and girls too. Field workers laboring in extreme and overheated conditions caused by climate change suffer serious health problems, as well as the inability to maintain a livelihood based on skill labor. The extreme heat conditions also damage crop production for the rural poor and other subsistence and small holder agriculture families whose output is directly consumed by them. Food costs go up yet the workers don’t get the increase. Food becomes a scarcity impacting the development of children. 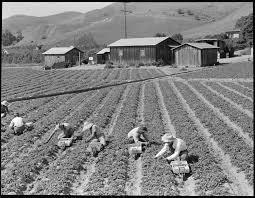 Many agricultural workers and farm owners, many already on the lower economic “chain,” have been forced to shut down creating fewer basic resources for healthy family survival. These families are often those already the poorest and most in need. Climate change, it has been scientifically demonstrated, impacts healthy water supplies which affects pregnant women and their baby both laboring to bring forth life. Pollution in the waters causes disease, malformation, and miscarriages or at times spontaneous abortions. Yes, pollution of our waters is not only impacted by climate change. It is also about our throw away, do whatever I want societal mentality. Yet, we need to be aware of pollution that we create that changes the healthy atmosphere that changes the waters. As we think of this sample of laborers being impacted today, perhaps we need to reactivate our awareness and actions in light of Catholic social teaching. Are we working to stop exploitation, climate change devastation, water pollution? Are we doing our part in making our voices heard to our elected government officials to move things toward healthy labor, healthy lives, elimination of poverty and hunger so all can have enough? Thank you for your thoughtful and challenging blog. B the B, happy I read this right before liturgy! Today’s gospel challenge is a similar call to self reflection. Thanks. Thank you, Barbara. This brings the message of Love, Mercy and Justice to the reality that is our world. – Women (We recall how he named them, e.g. Look at her face. She’s not fit to be president!) It’s uplifting to see new, relevant women (and men) emerging as we prepare for the elections. Also, hopefully it will happen faster in the Catholic church. – Field workers: We read they are not coming to do such back-breaking work. This will affect future production. They are rapists and murders and should not be admitted into our country. – Climate change – It’s happening all around us, and he destroys laws promoting enviromental protection. Hopefully our voices will be overwhelmingly proclaimed, especially during the upcoming elections. Barbara, having spent Labor Day laboring at a meeting of contemplative women, I appreciate so much your observations and questions regarding so many prevalent unjust labor practices. Thank you for inviting all us to deeper reflection about how to respond to this injustice ever present in our country and the rest of the world. Thank you Barbara. The timelessness of Catholic social teachings reminds all of us of our personal responsibility to name the injustices in our own neighborhoods and beyond. One step at a time! The work continues and part of our role is to nurture and empower the next generation that will follow us.